For Winslow's son, see Kellen Winslow II. Kellen Boswell Winslow Sr. (born November 5, 1957) is a former American football player in the National Football League (NFL). A member of the Pro Football Hall of Fame, he is widely recognized as one of the greatest tight ends in the league's history. Winslow played his entire NFL career from 1979 to 1987 with the San Diego Chargers after being selected in the first round of the 1979 NFL Draft. He played college football for the University of Missouri, where he was a consensus All-American. He was also inducted into the College Football Hall of Fame. Winslow did not play high school football until his senior year. Until then, he was a self-described "nerd" who played chess. In college, Winslow played for the Missouri Tigers, and was a two-time all-conference selection in the Big Eight and a consensus All-American in 1978. He was drafted in the first round of the 1979 NFL Draft by the Chargers and played for them until 1987, when he retired from football due to injury. After a knee injury prematurely ended his rookie season, Winslow, as part of Air Coryell, led the NFL in receptions in 1980 and 1981, becoming the second tight end ever to lead the league in receptions in back to back seasons. His 89 catches in 1980 was an NFL record for tight ends, breaking the previous mark of 75 held by Mike Ditka. He also exceeded the 1,000 yards receiving milestone in 3 different seasons, including setting an NFL single season record for receiving yards by a tight end with 1,290 yards in the 1980 season. The record stood until Rob Gronkowski totaled 1,327 in 2011. In a 1981 regular season game, Winslow tied an NFL record by catching five touchdown passes. In a 1981–82 playoff game against the Miami Dolphins that became known as The Epic in Miami, Winslow caught a playoff record 13 passes for 166 yards and a touchdown, while also blocking a field goal with seconds remaining to send the game to overtime in one of the greatest single player efforts in NFL history. Winslow's yardage total stood as the playoff record for tight ends for 30 years until Vernon Davis's 180 yards in 2012. What made Winslow's performance all the more memorable was that fact during the game he was treated for a pinched nerve in his shoulder, dehydration, severe cramps, and received three stitches in his lower lip. After the game, a picture of Winslow being helped off the field by his teammates became an enduring image in NFL Lore. Tight ends prior to Winslow were primarily blockers lined up next to an offensive lineman and ran short to medium drag routes. Winslow was put in motion so he would not be jammed at the line, or he was lined up wide or in the slot against a smaller cornerback. Former Chargers assistant coach Al Saunders said Winslow was "a wide receiver in an offensive lineman's body." Chargers head coach Don Coryell said, "If we're asking Kellen to block a defensive end and not catch passes, I'm not a very good coach Back then, defenses would cover Winslow with a strong safety or a linebacker, as zone defenses were not as popular. Strong safeties in those times were almost like another linebacker, a run defender who could not cover a tight end as fast as Winslow. Providing another defender to help the strong safety opened up other holes. Former head coach Jon Gruden called Winslow the first "joker" in the NFL. He would line up unpredictably in any formation from a three point blocking stance to a two point receiver's stance, to being in motion like a flanker or offensive back. Head coach Bill Belichick notes that the pass-catching tight ends who get paid the most money are "all direct descendants of Kellen Winslow" and that there are fewer tight ends now who can block on the line. Winslow played in five Pro Bowls, was elected to the Pro Football Hall of Fame in 1995, and the College Football Hall of Fame in 2002. In his nine NFL seasons, Winslow caught 541 passes for 6,741 yards and 45 touchdowns. Kellen was a consensus All-Pro in 1980, 1981, and 1982. He is also a member of the NFL's 75th Anniversary All-Time Team. He was the San Diego Chargers' honorary captain at Super Bowl XXIX, and one of seven participants in the game's pregame coin toss, joining fellow 75th Anniversary Team members Otto Graham, Mean Joe Greene, Ray Nitschke and Gale Sayers, as well as fellow PBHOF Class of 1995 members Steve Largent, then a U.S. Congressman, and Lee Roy Selmon. Winslow worked as a college football announcer with Fox Sports Net. 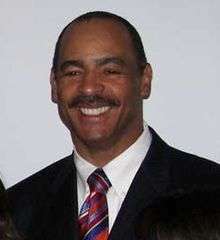 In 2008, he was appointed the Athletic Director of Central State University in Ohio. In 1999, he was ranked number 73 on The Sporting News' list of the 100 Greatest Football Players of all time. Winslow's son, Kellen Winslow II, also played tight end in the NFL. Winslow II was drafted in the first round of the 2004 NFL Draft from the Miami Hurricanes by the Cleveland Browns, the team the Chargers traded with to draft the elder Winslow in 1979. He wore his father's jersey No. 80 when he played for the Cleveland Browns, as a sign of respect for his accomplishments. ↑ "Tight end rankings: Do Sharpe, Gonzalez deserve top spot?". USA Today. 2008-07-21. ↑ McMurphy, Brett (7 April 2014). "Sources: FAMU hires Kellen Winslow". ESPN. Retrieved 13 October 2014. ↑ "Winslow Sr. hired to guide Central State into full Division II membership". Wilburforce, Ohio. Associated Press. 14 August 2008. Retrieved 13 October 2014. ↑ "Pro Football Hall of Famer Kellen Winslow to lead Lakeland athletics, wellness". Sheboygan, Wisconsin: Lakeland College. Archived from the original on 21 August 2012. Retrieved 13 October 2014. Pro Football Hall of Famer Kellen Winslow Sr. today was named vice president for athletics and wellness at Lakeland College. ↑ Goforth, Allan (2003). Tales from the Missouri Tigers. Sports Publishing. p. 188. Retrieved March 23, 2014. ↑ Moore, David Leon (January 11, 1981). "The men who get Air Coryell off the ground". The Sun. San Bernardino, Calif. p. D-4. Retrieved May 9, 2015 – via Newspapers.com. ↑ "Chargers epic '82 playoff win in Miami". Chargers.com. Dorling Kindersley Publishing Limited and National Football League Properties, Inc. 18 January 2002. Retrieved 13 October 2014. 1 2 Jaworski, Ron (2010). The Games That Changed the Game: The Evolution of the NFL in Seven Sundays. Random House. p. 92. ISBN 978-0-345-51795-1. ↑ "Ex-Chargers coach Don Coryell dies". Retrieved 2010-07-02. Wikimedia Commons has media related to Kellen Winslow.